I saw this done in this month's issue of Women's Day Magazine. Measure strips of tissue paper and cut to fit the size of jar. Brush glue on a small section and adhere tissue paper. The article said to dilute the glue to 3 parts glue, 1 part water. We just winged it. We overlapped a little bit. Cover the outside of the jar and let dry. Cut out shapes in black construction paper and glue onto the jar. 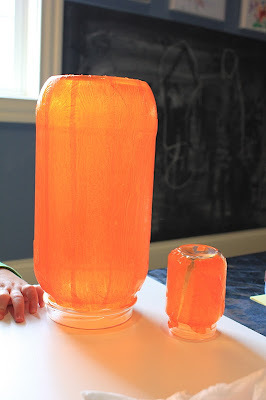 Apply glue to entire jar to seal and let dry over night. Article said to place battery operated votive candles in but we just used real tea lights. My 19M old could care less about this one. Oldest takes a break to play, too. 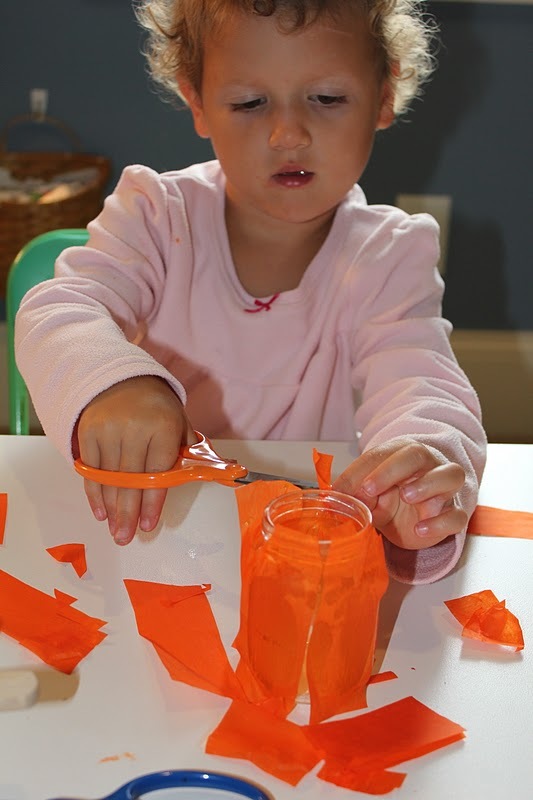 Picking glue off the fingers was fun, too! Cutting off the excess. She is very meticulous! What a great idea! 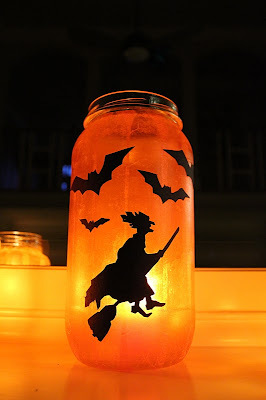 I think I'm actually going to do this with some old mason jars I've accumulated! And, I used to douse my hands in glue just so I could peel it off. Now that I think about it, I want to do that now too! Thanks for the idea! Our church does an annual "trunk or treat" that we take the girls to each year. While we can't do actual fire (Lily's on oxygen and has to be 8 feet away), this looks like it would be fun with electric candles. Wonder if it would work well with plastic containters under those circumstances? I'm in love with this idea! Thank you so much for sharing! Looking forward to doing this with my kids! Gotta remember to save jars! I wish that in future such posting should go on.